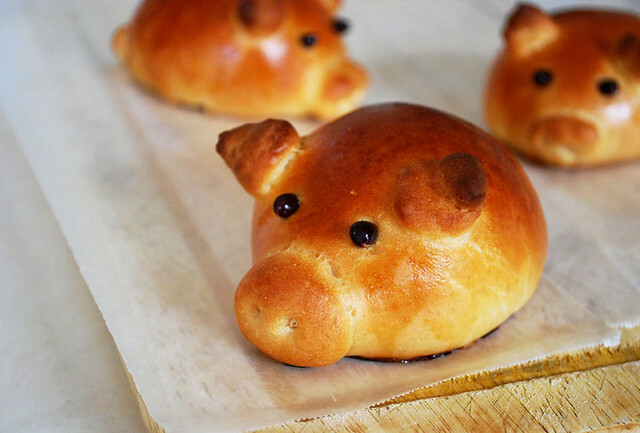 These piglet buns are adorable and delicious. The salty and spicy sausage is perfectly complimented by the fluffy and slightly sweet bread which also absorbs the grease from the meat. They’ll be a huge hit with kids; my little brother loved them, which must be the only reason they disappeared from the house within two days, right? Ha. I came across this idea on Kanela y Limón, under the name “Cerditos Preñaos,” or “pregnant piglets.” For my version, I used the Pioneer Woman’s sweet roll recipe for the dough, and used Italian sausage instead of chorizo. I’d suggest cooking the sausage before making the dough, so that they have time to cool before you wrap them in the dough. To assemble the piglets, divide the dough into 13 pieces. Set aside one of the pieces to make the snouts, ears, and tails. 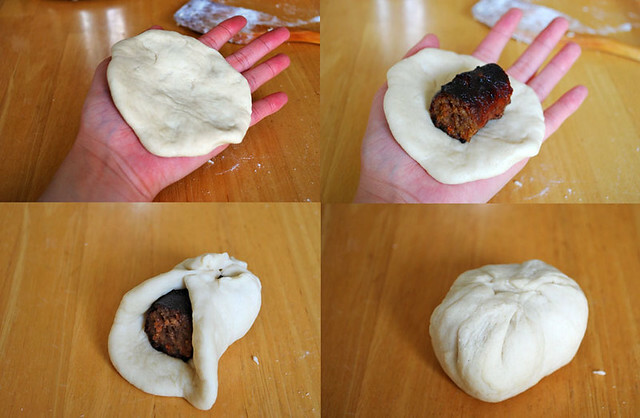 Take a ball of dough, flatten it into a 4-inch circle, and place a piece of sausage in the center. Gather together the edges of the circle and pinch them together. Place them seam-side downwards onto a greased baking sheet, cover with a damp towel, and let them rise for 20-30 minutes. They shouldn’t grow too much bigger, but they should get a little puffier. I found that it was easier to stick the ears and snouts on the pigs after the egg wash dried a little bit, so I suggest working in groups of three: brush three of the buns with egg wash, make snouts for each, and do the same with the eyes, ears and tail. To make the snout, shape a small piece of dough (about the size of a large pea or a small marble) into an oval. 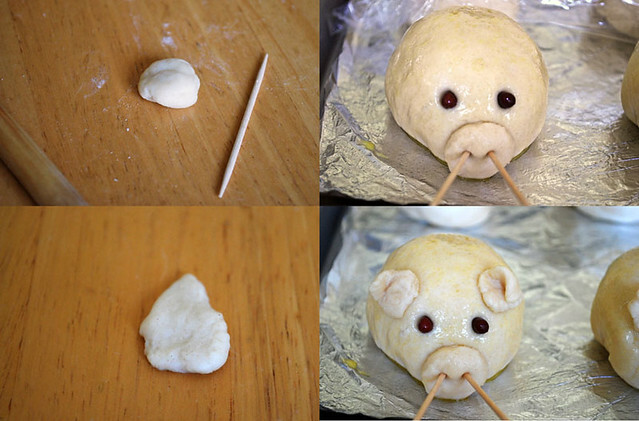 Place it onto the face of the pig, and stick two toothpicks into the center of snout. You’ll bake them with the toothpicks in the dough so that the holes don’t close. Shape two tear drops for the ears, and place them on top of the head. You can fold them down a little if you want. And don’t forget to put a little ball of dough in the back for a tail! Bake them at 425 degrees Fahrenheit for 15-18 minutes, let cool, and gently remove the toothpicks. Man, I’m having way too much fun with these. Enjoy, everyone! In a pot over medium heat, mix together the milk, sugar, and vegetable oil. Heat until the mixture is just below boiling. Let cool until lukewarm. Sprinkle the yeast over the liquid and let it sit for a minute. Stir in 2 cups of flour. The mixture will be very sticky and wet. Let rise in a warm place for 1 hour. 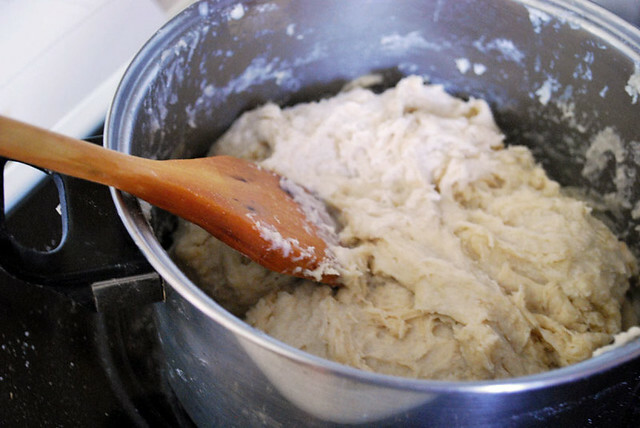 After the dough has risen for 1 hour, stir in the remaining 1/4 cup flour, the baking powder, baking soda, and salt. If the dough is still too wet to work with, add in a little more flour. Divide the dough evenly into 13 pieces. Wrap one of the pieces in plastic wrap and set aside. Flatten one of the dough balls into a circle roughly 4 inches in diameter, making the edges of the circle slightly thinner than the center. Place a piece of sausage at the center of the circle. Gather the edges of the circle around the sausage so that they meet in the middle. Press down on the seams. The dough should be in the shape of an oblong sphere. Place on a greased baking sheet, with the seam facing down. Repeat this process 11 more times. Cover the dough balls with a damp towel or plastic wrap, and let rise in a warm place for 20-30 minutes, until slightly puffy. Preheat the oven to 425 degrees F. When assembling the pigs, it is best to work in batches of three. Beat the egg and brush 3 of the dough balls with the egg wash.
Make the snouts for the pig: Unwrap the dough ball you set aside. Break away a piece of dough about the size of a large pea or a small marble, and flatten it into an oval. 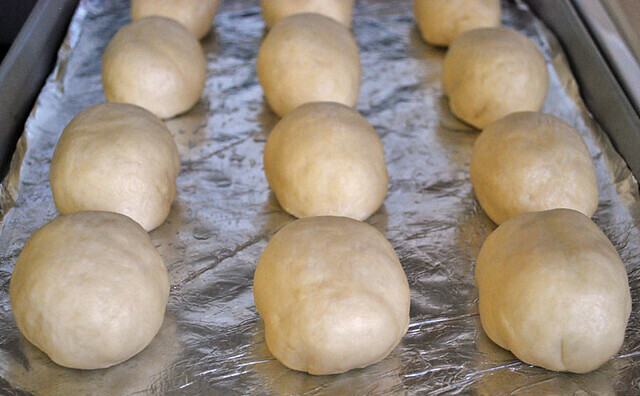 Place the oval on the side of the dough ball (one of the narrower ends of the oblong sphere). Stick two toothpicks into the oval to make the two nostrils. You will leave the toothpicks in the dough while baking to keep the holes from sealing up in the oven. Repeat this process for the two other dough balls you brushed in egg wash.
Place two azuki beans, cloves, or peppercorn above the snout for eyes. Do the same for the other two dough balls. 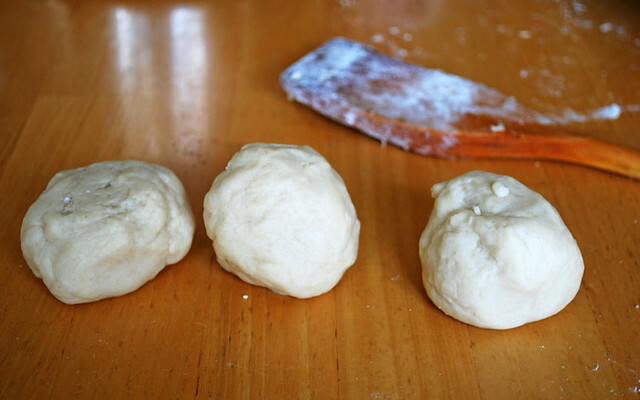 Form two pea-sized pieces of dough into teardrop shapes. Place above the eyes for the pig’s ears. Repeat two more times. 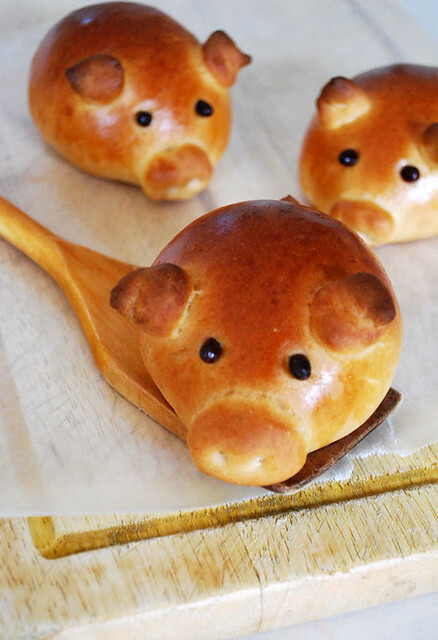 Place a pea-sized piece of dough on the back of the pig for a tail. Repeat twice. Repeat this process for the other 9 dough balls, working with 3 at a time. Place in the oven and bake for 15-18 minutes, until golden brown. Let cool, and carefully remove the toothpicks from the pigs’ snouts. AHHHH another piggy bun to join mine! I love this post the sausage is nice touch! 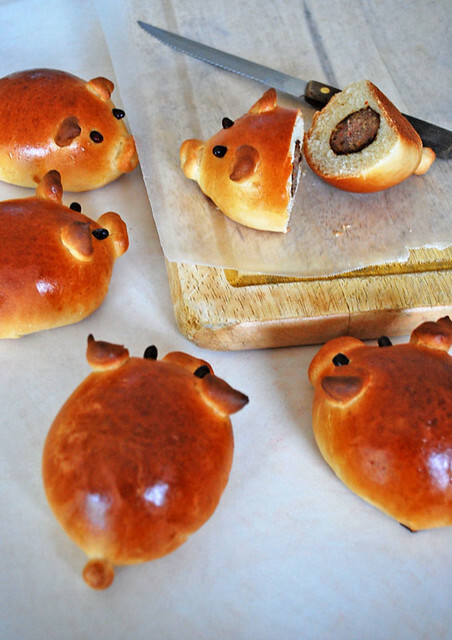 I made piggy buns too when I started blogging. I would love for you see them too. You are such a good bread baker. OMG these are darn cute!! Seriously, I am just smiling from ear to ear about these cuties! ummmm these are the cutest things ever! great post!! Weeeeee weee weeeeeeeee weeee weeeeeee!! LOVE IT!!! My gosh, these little pigglets are warming my heart! Headed to check out Caroline’s site now! Oh so cute! Perfect for a children’s party or better yet a baby shower. My kids would love these! They came out perfect! I think seeing these in person would brighten anyone’s day! Oh my goodness, these are SO unbelievably cute, Monica! What a great guest post! OMG I’M DYING. Stephanie, these are SO CUTE. Holy crap these are insanely adorable! OMG – these are adorable. I must make next time we have kids coming over for dinner!! these are seriously SO cute!!! shut. the. front. DOOR! I can’t even handle this. TOO MUCH CUTE. The cuteness of these is ASTOUNDING! I almost want to hug them! OMG….the cuteness is killing me!! I can’t even begin to say how cute these are…I love this idea so much!! Those are pretty adorable!! lol… how cute… and so creative! Okay seriously, this is just too cute! I have to make this for my niece and nephews – they would LOVE it! I am DYING over these and all their cuteness! I need to make these for my nieces! They’ll gobble em’ up. I just made these but I didn’t have sausage on hand, so I mixed up some herb and garlic cream cheese, cheddar, and bacon bits and stuffed the buns with that. They came out amazing and adorable. Can’t wait to surprise my boyfriend with them! If you left the sausage out these would make cute decorations if you put shellac on them to preserve. Just make sure no one tries to eat them. Can these be made up ahead of time? Or can the dough sit overnite and assemble the next morning? Prefer to make up night before and just stick in the oven? 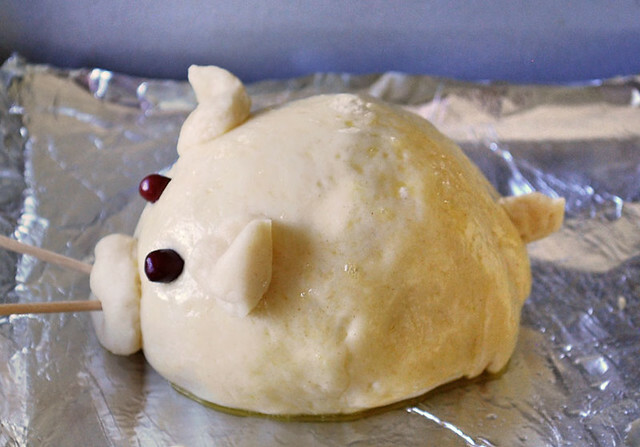 Jacque — I didn’t make the recipe (it’s a guest post) so I can’t say for certain, but I’m sure you can make the dough ahead of time and refrigerate it overnight, then bring it back to room temperature before assembling it into “piglets.” Hope that helps! Thank you, I did and they were adorable! Hit of my brunch!!! Can they be made the night before and put in the fridge till morning.? Can they be made the night before and put in the fridge? Ladawn — I didn’t make the recipe myself (Pass the Cocoa did), but my guess is yes, you can refrigerate them (fully made/baked). Brandy — Yes, you probably could! do we need to use the sugar in the dough – or will it be fine if we omit it? I am thinking of using little cocktail weenies..or pieces of hot dog – for a spin on the pigs in a blanket idea. Gotta try these! They are adorable!! Love to cook and these look adorable. 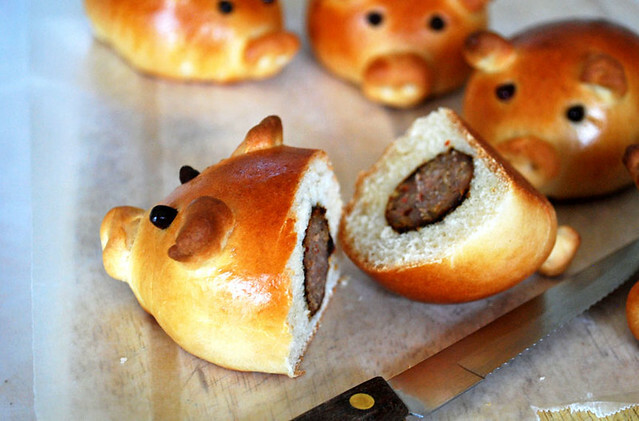 Wow lovely idea…the piggies look so adorable!! My daughter is going to love these. I don’t know if she will eat them as much as she will love it. She loves piggies. Going to try this tomorrow. Super excited! Hehe! I love it! So cute! I’m gonna have to try this out sometime. Ohh-I just found these & I just Adore Piggies! I’m not that great with yeast doughs-though; but I’ve got to give this one a shot. Wish me luck. I would love to do these for a cute Barnyard Display for Easter-but I’m going to try them out before hand -to see how they come out 1st. Thanks so much for being here & sharing with everyone. Happy Valentine’s Day. Are you able to make and ship these? since I’m no chef, would I be able to use pre-made dough and wrap around breakfast sausage? Also, I will be bringing them to a breakfast function- best way to warm them up, as I don’t want to get up at 4am to then take to work. Quite possibly the most offensive thing I’ve ever seen. You want to make “cute piglet shapes,” then stuff them with real-life cute piglets who have been brutally slaughtered? Wow. Have a heart. They are yummy too! I have made these several times! Even my husband likes them!!! Such a cute idea! But what did you use to make the eyes? Michelle — They used Azuki beans, cloves or peppercorn for the eyes! This is beyond cute!!! Love it!! these are so cute i love them!!!!!!!!!!!!!!!!!!!! How far in advance can you make these? Are they still good reheated the next day? I want to make these sooo bad for our easter potluck. now to figure out how to make them breakfast-y. maybe wrapping cheese and eggs around a sausage, with maybe a biscuit-y dough.